The very welcome announcement of the massive allocation by ComReg of low-band VHF spectrum to the Amateur Service raised some questions about the wording in the document. The use of AMSAT in ComReg Document 09/45 R4 is regrettable and is a legacy issue carried forward from earlier versions of the Amateur Station Licence Guidelines. Most of ComReg’s documents are commercially sensitive and no draft documents (other than consultations) are published. Although documents relating to amateur radio are not commercially sensitive we do fall under the non-publishing of draft documents embargo. The use of AMSAT somewhat randomly confuses the actual situation regarding satellite operation. The frequencies in Annex 1 of the Guidelines are available to all CEPT Class 1 and Class 2 licensees. So far as satellite operation is concerned amateurs here can use the satellite segments mentioned (435-438 MHz; 1260-1270 MHz: 5650-5670 MHz –uplink and 5830-5850 MHz –downlink). 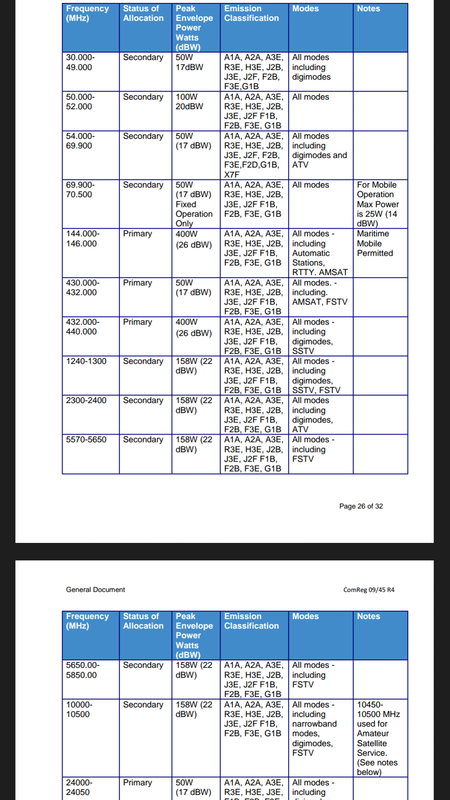 The “All modes” in the Modes column in Annex 1 covers the relevant operating mode for the satellite concerned. Similarly 10450-10500 MHz can be used for satellite communications. In the Modes column of Annex 1, all modes are indicated. In many cases “including digimodes” is stated but of course ‘all modes’ includes digimodes. In the definitions in Annex 1 digimodes are defined as “Any digital mode such as —–“. So DSTAR, DMR etc would be included. We will of course work with ComReg to secure additional spectrum and facilities. The present initiative by ComReg is as a result of such work by IRTS. In this context we would hope in the future to get 2400-2450 MHz among the bands on general release. Finally some people are wondering why we didn’t get 52-54 MHz. We have of course been seeking this. However, as you know the question of granting 52-54 MHz to Region 1 of the ITU to align with ITU Regions 2 and 3 is the subject of Agenda Item 1.1 of WRC-19. ComReg will be involved in in seeking to establish a CEPT Common Position and so will not move on it before WRC-19. If the IARU WRC-19 initiative is not successful we will seek a national allocation at 50-54 MHz under Article 4.4 of the ITU Radio Regulations. I realise that the somewhat random use of “AMSAT” and the use of “All Modes” in some places and “All modes including digimodes” in others can lead to confusion. I hope my attempt to ‘clarify’ helps.